RIO DE JANEIRO – “The record industry is in the process of a complete transformation, especially for instrumental and jazz music” Scott Feiner, the critically acclaimed musician and creator of pandeiro jazz, explains over a coffee near his Botafogo home. “Labels want a completed product. They expect the mixing, production, even sometimes all the artwork, to be done”. Scott Feiner performing with the pandeiro in New York City, photo by Ira Fox. The difficult and expensive process of making and releasing records is what has led the New York-born former jazz guitarist to create a Kickstarter project, an online platform that allows people to amass funding for projects through individual pledges, to enable the release of his third album, Accents. Feiner is no stranger to the business of music-making. In the last five years he has released two albums, one of which was nominated for a Grammy, and toured the world with his unique sound – a blend of Brazilian percussion through the pandeiro drum and New York jazz. 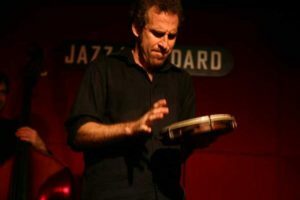 Coming from the New York jazz scene, where he was a guitarist with a number of bands on the circuit, to Brazil on holiday in 1999, Feiner fell in love with the pandeiro drum. This traditional Brazilian hand-held instrument used in samba, choro and Capoeira music is member of the tambourine family but distinct in that it can be tuned, has a crisper jingle tone and the way in which it’s played is more nuanced meaning it can produce a wide variety of delicate, raspy rhythms. 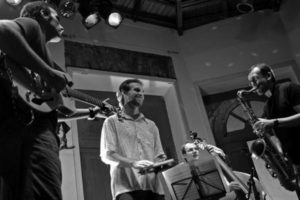 After learning the pandeiro craft practicing to samba and choro records in New York before coming to live in Rio, and perfecting it performing in Lapa, Feiner found himself drawn back to his jazz roots. On a visit back to New York he played an improvised jazz gig with the instrument, which lead to the recording of his first album, Pandeiro Jazz, released in 2005. Critical acclaim, world touring, an online pandeiro store pandeiro.com and a second major Brazilian record label release, Dois Mundos in July, 2008 followed, and now Feiner is looking to release his third album Accents, recorded with the same New York musicians that created his ground-breaking first album. Jamming at the Centro Cultural Carioca in Rio De Janeiro, photo by Duda Simões. Kickstarter allows business projects to be funded through pledges or promises to donate an amount of money if the total needed is pledged within a certain time period. Projects have a multimedia profile page, updates and information on what you can get for your pledge. On Feiner’s page you can view a video overview of the Accents project and pledgers who contribute to the US$10,000 goal can receive from; digital download of the album for donations of US$10 to a goody bag of signed merchandise, gig tickets and personal tour guides of Rio for pledges of US$1,000. Feiner is enthusiastic about the project but as the January 31st deadline draws nearer, he’s calling for support to raise the remaining US$9,000 to enable the release his latest masterful fusion of Brazilian music and jazz. “$10 is the price of a sandwich and a coke, but enough individual pledges of $10 could make this record happen”, he says, clearly anxious about the approaching time limit but remaining passionate about the possibility. What is certain, is that Feiner’s unique pandeiro jazz will continue to enchant audiences around the world as he gears up for a year of more international touring where he looks set to play the summer festivals in Europe and dates in Brazil and as well as starting to compose a fourth album. First though, there is still time to get that existing third album out. To support Scott Feiner’s Accents album, go to his Kickstarter page and make a pledge.